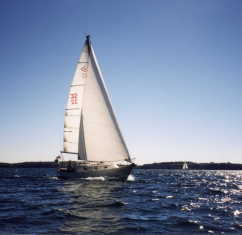 Chris and Sue hope to take Titania down to the Chesapeake this fall (2000) spending about a month (a leisurely trip). We'll haul her out for the winter and then bring her back next spring to upstate NY. A number of things have to go right for this scheme to succeed: the newly rebuilt motor has to run (there'll be a lot of motoring – much of the trip is in canals); the new power system (golf cart batteries, high output alternator) has to keep our computers running so Chris can work (he does have a job you know! ); our marriage has to survive the experience of living together in a space of about 80 square feet; amongst others. September 5, 2000 Preparations for departure reach a frenzied state! September 6, 2000 Fairhaven, NY: We move aboard. September 7, 2000 Fairhaven, NY: Ready to go. September 8, 2000 Pheonix, NY: Survived our first locks. September 9, 2000 Sylvan Beach, NY: Oneida Lake behind us. September 10, 2000 Little Falls, NY: Start our way down to the Atlantic. September 13, 2000 Amsterdam, NY: Lock 11. September 14, 2000 Waterford, NY: Guard Gate 2. September 16, 2000 Middle Ground Flats Island, NY: North of Athens. September 17, 2000 Saugerties, NY: Esopus Creek.